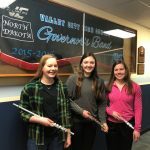 VALLEY CITY, N.D. (NewsDakota.com) – Valley City High School instrumental students competed in the EDC/State small group instrumental contest at Grand Forks Red River High School on February 21. Valley City entered a total of 14 instrumental groups in the contest. The results are listed below. The ratings are classified as follows: III – fair performance, II – good performance, I – excellent performance, region star – superior performance, and state star – state superior performance. Receiving a II rating were Hale Kringlie/Blake Hagen/Nicholas Pfeifer/Nathan Eldridge/Braylen Bruns/David Peterson (mixed brass ensemble), and Connor Pfennig/Conner Remick (alto saxophone duet). 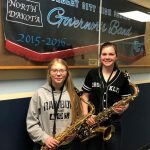 Receiving I ratings were Avery Suhr/Hailey Thoreson/Kaycee Smith (saxophone trio), Cara Van Bruggen/Austin Rogelstad/Kaylee Smith/Luke Plagens/Jayton McConnaughey/Owen Plagens/Buddy Scherr (mixed brass ensemble), MaKaelyn Lorenz/Samantha Nelson (flute duet) Makayla Nehlich/Makaelyn Lorenz/Samantha Nelson (flute trio), Julianne McPartland/Britta Roehrich (flute duet), Samantha Nelson/Eliza Johnson/Makaelyn Lorenz (mixed woodwind ensemble), Aurora Ziniel/Jerrica Eldridge/Avery Suhr/Alexa Kjelland/Daniel Wintch (mixed woodwind ensemble). 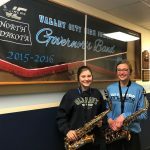 Receiving Region Star ratings were Britta Roehrich/Abigail Peterson/Julianne McPartland (flute trio), Alexa Klein/Alexis Triebold (alto saxophone duet) and Camryn Sundlie/Rachel Sand (tenor saxophone duet). 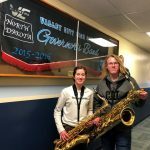 Receiving State Star ratings were Christian Hanson/Sophia Boe (tenor saxophone duet) and Alexis Triebold. 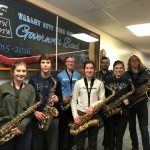 Alexa Klein/Bennett Rogelstad/Presley Curtis/Sophia Boe/Trevan Pfennig/Christian Hanson (Saxophone Ensemble).